reviews of those. Without my rambles ( uff! So difficult! ) here goes my list. L'Oreal BB Cream: I am loving it though I do not 'want to' fall in love. circles to a great extent. I could write an ode to it! Motives Contour and Highlight: This is a gem I have rediscovered. When I had received it, I did not know much about contouring. Neither was I equipped enough to work with contour powders. This is just a heavenly duo! Faces Blush in Rose Gold: Love! If you are in a dilemma about what to wear for blush, go with this. I think it comes very close to MAC's coconut or cocoa, some color I recently saw on an youtube channel. It adds definition to my cheekbones as well as gives a gentle flush. It can be paired with almost any lipcolor. Motives highlighter: It's wonderful! Pale beige in color, very finely milled shimmers, works wonder for my yellow toned skin. Maybelline Hyper Glossy Liner: Glossy, intense, had a good brush, waterproof and yet comes off easily, a formula made just for me! Makeup Academy Eyeshadow palette Undress Me too: Very handy. L'Oreal Paris Kajal Magique: Initially I wasn't impressed. But, as I layered it on, i found it stays put on my lash line for really long time and on layering, it stays on and on for me. yes, it has stayed on for around 8 hours with little smudging. By now, I have almost run half the size. Inglot Eyeshadow base: I never liked neutral shadows. This product came as a blessing. Even though it does not prevent creasing like a good primer should, as a base, it works amazing. Ever since I got this, I have got hooked on to neutral shadows because now they show up well on me! Now, I normally wear all kind of lipsticks. But I reached out mostly for these four. if you observe, they are pinks, peaches and reds. In short, all kind of colors. Lakme Enrich Satin Color shade 135: It is one of the prettiest and truest pinks! I love love love it! Yes, mind, it has more to it than what meets the eye. The pink looks really bright on the lips! Bourjois Sweetkiss Lipstick: Peche Volupteuse. I love this peach color. It lifts my complexion and I look awake! Maybelline Pink Alert POW 3: I think I could stop the cars with this one! Last, but not the least, MAC Ruby Woo: Yes, the man bought me because he knows I am a miser and have always wanted only this product from MAC Cosmetics. So, this is it. 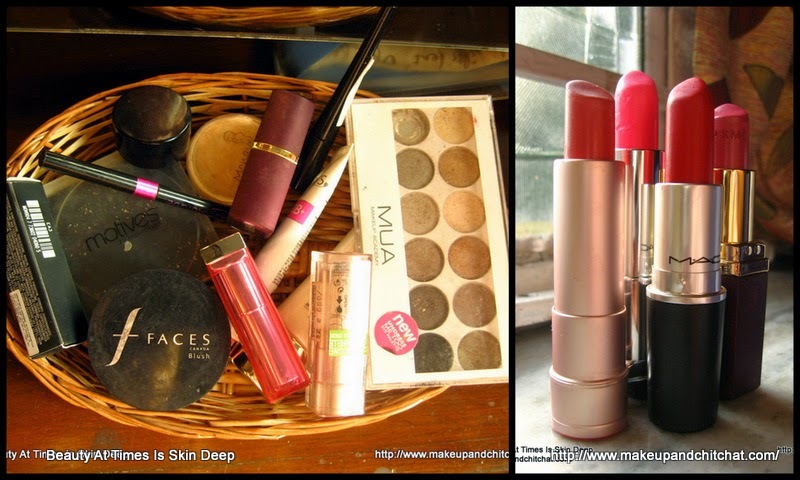 My modest makeup love; Let me know what makeup you are loving this May.